I heard about lock bumping last month from a friend. I figured it was all just a bunch of hokum. But I checked it out. It's not a myth, it's not an urban legend. Crooks can make a generic key to open any lock, including yours. And it's easy. As the video below will show, even a child can do it. So, what is Lock Bumping? It's a technique that's been around for many years (some say it dates back as early as the 1950s) and it's a simple way to 'pick' a pin tumbler lock using a bump key. And more scary is this...one bump key will work for ANY lock. Ok, then what's a bump key? I don't want to go into explicit detail here, for obvious reasons, but a bump key is basically a blank key that has been filed down to the lowest level in each groove. It will slide into any pin tumbler lock and enable the would-be thief to gain entry to your home in seconds. Again, without delving too deep into specifics, the technique involves sliding the 'bump key' into the lock and giving it a thump. The tumblers inside will align, you give the key a turn, and quicker than you can say 'where's my DVD player?' the thieves are in to your home and ripping you off. The video below is quite scary, and shows you just how easy it really is. Scared? You should be. So, how do you protect yourself? Fortunately, Lock Bumping does have counter measures. And believe it or not, more expensive locks are actually more vulnerable and open to attack. Because they are more precisely machined, expensive locks will turn more easily after a bump. The same goes for locks made of hardened steel, as they will sustain less damage during a bump. 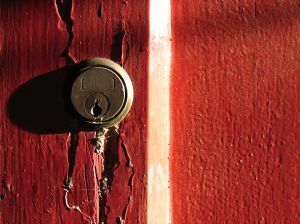 A cheaper lock may not withstand the force of the knock and refuse to turn. They do exist. They range in price from just under $100 to, well, several hundred dollars. But when you consider the financial costs of replacing your valuables or your identity, that's not so bad really. The most affordable bump-proof lock I discovered was at a site called wholesalelocks.com. Their Bump-roof BiLock looks like it's tough as nails. That's one serious looking lock. Other bump-proof locks that I've found, although not quite as affordable, include Medeco , Videx Cyberlocks , Mul-T-Lock , and GoKeyless . I'm sure there are a few other secure locks on the market too. Just pop down to your local DIY store and ask if they have any Bump-Proof locks. If they don't (which is likely) they can certainly point you in the direction of someone who does sell them. Is there a quick-fix solution? There are a few. Your local locksmith is well aware of Lock Bumping, and can come out to your home and make your current locks more secure. If you don't fancy the call out charge, you could always fit an additional Mortise or Deadbolt lock to each exterior door. Unlike cylinder locks, these are far more difficult to bypass (although nothing is impossible), and two locks on a door is also a good deterrent. Finally, if it's so prevalent, why aren't lock manufacturers doing anything? Good question, right. The answer is an old one. Money. Right now, less than 5% of the population knows about Lock Bumping, and even fewer really give it the attention it deserves. The cost of making bump-proof locks is much higher, which means the cost to buy them is higher. And ultimately, that higher price point affects the bottom line. So, that's the scoop on Lock Bumping. Much more information is out there on the web if you really want to find it. More worrying, if you can find out how to make a bump key, so can any thief. Yikes. Now, I'm off to buy a Doberman with sharp teeth and an appetite for criminals. hey check out this story on lock bumping. who would have ever thought? what will the criminals think of next? Public service site about lock bumping and how to protect yourself against it! lockbumping.org is a good site. They do have a downfall though... not updated enough. For updated info check out http://www.bumpkeyforum.com I've been able to figure out how to protect my house a lot better now. I found a real informative site that may be worth checking out if you are interested.